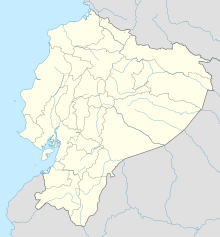 Colonel Carlos Concha Torres Airport (Spanish: Aeropuerto Coronel Carlos Concha Torres) (IATA: ESM, ICAO: SETN) is an airport serving the Pacific coastal city of Esmeraldas, capital of the Esmeraldas Province of Ecuador. It is 3 kilometres (1.9 mi) east of the city, across the Esmeraldas River in the parish of Tachina. Established in 1940 as General Rivadeneira Airport, the airport was renovated between 2012 and 2013, receiving a new terminal and a lengthened runway. It is served by TAME, which offers flights within Ecuador and to Colombia. The airport was established on 25 March 1940, upon the upgrading of the runway. It was originally named in honor of José Enrique Rivadeneira, an inspector general of the Ecuadorian navy who died in a 1939 plane crash. The Ecuadorian government renovated the airport in 2014 as part of a plan to modernise the country's airports and attract more tourists and businesses to Ecuador. It also held a contest in which the people of Esmeraldas voted on a new namesake. Carlos Concha Torres (es), an army commander who led a war against President Leónidas Plaza in the 1910s, received the most votes. The newly constructed passenger terminal was inaugurated on 14 January 2014 by President Rafael Correa. The terminal has a capacity for 275 passengers and can handle 250,000 per year. A new apron and air traffic control tower were also built, and the runway was lengthened by 200 metres (660 ft). Additional work was completed on taxiways, fuel plant, and other facilities. The construction work cost over US$45 million and lasted 17 months. The Esmeraldas VOR-DME (Ident: ESV) and non-directional beacon (Ident: ESM) are located on the field. ^ Airport information for Esmeraldas at Great Circle Mapper. ^ "Libro de consulta para esmeraldeños" [Encyclopedia for the people of Esmeraldas]. La Hora (in Spanish). 18 April 2010. Retrieved 25 September 2016. ^ a b Risco, Giannella (2014). Remodelación de la terminal aérea del Aeropuerto General Rivadeneira en la provincia de Esmeraldas [Renovation of the terminal at General Rivadeneira Airport in Esmeraldas Province] (Thesis) (in Spanish). Universidad de las Américas (Ecuador). p. 16. Retrieved 25 September 2016. ^ "Six dead in big Ecuador air crash". Singapore Free Press. 8 October 1939. Retrieved 25 September 2016. ^ Iza, Mónica (14 January 2014). "Esmeraldas tiene un nuevo aeropuerto internacional para potenciar el turismo" [Esmeraldas has a new airport terminal to promote tourism]. El Ciudadano (Ecuador) (in Spanish). Retrieved 25 September 2016. ^ "Aeropuerto de Esmeraldas será 'Carlos Concha Torres'". La Hora. 17 May 2013. Retrieved 24 September 2016. ^ a b c Toro, Manuel (15 January 2014). "Inaugurado aeropuerto en Tachina" [Inaugurated airport terminal in Tachina]. El Universo (in Spanish). Retrieved 24 September 2016. ^ a b c Toro, Manuel (21 November 2013). "Nuevo aeropuerto de Esmeraldas se encuentra operando desde el lunes" [New airport terminal in Esmeraldas operating since Monday]. El Universo (in Spanish). Retrieved 24 September 2016. ^ a b c "Correa inaugura aeropuerto en Esmeraldas" [Correa inaugurates airport terminal in Esmeraldas]. El Telégrafo (Ecuador) (in Spanish). 14 January 2014. Retrieved 25 September 2016. ^ "El aeropuerto de Esmeraldas se inauguró y tiene vuelos a Colombia" [Airport in Esmeraldas was inaugurated and has flights to Colombia]. El Comercio (Ecuador) (in Spanish). 14 January 2014. Retrieved 25 September 2016. This page was last edited on 8 April 2018, at 15:01 (UTC).